The train control is supposed to be done with a real throttle for the manual parts of operation. Name/ID of the selected operator. Locomotive ID to use with this consist. If the locomotive has Multiple Units defined they will also be controled by this ID. Reserve the location for the loco and train. 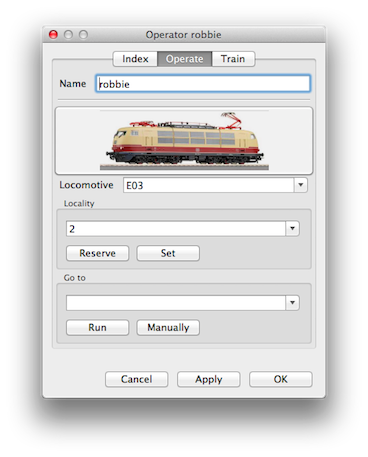 Set the locality of the train independently of the loco. Destination to make an auto mode run from the current location. Start the run to the GoTo destination. Start the run to the GoTo destination in manual mode.